Ahmad Ibrahim al-Mughassil thought he was untouchable. For 19 years, he has been a wanted man, moving and hiding in the shadows of Iran, Syria and Lebanon. Armed with a disguise and what he thought was a sanctuary in Beirut, he enjoyed the protection of Hezbollah and the Iranians. But that all changed recently, when one of the most wanted Saudi Hezbollah terrorists was captured and spirited back to Saudi Arabia. Ahmad Ibrahim al-Mughassil was the military commander of Saudi Hezbollah (Hizbullah al-Hijaz). But what truly made him a dangerous terrorist was that he was a hands-on terrorist and part of the Iran’s proxy war against the United States. On the south side of Damascus, tucked behind layers of shops, markets and hotels geared towards Iranian pilgrims is the Sayyeda Zeinab Mosque. This Iranian styled Mosque is where Ahmad al-Mughassil would meet and recruit terrorists for Saudi Hezbollah. Al-Mughassil would then make arrangements for the new recruits to travel to Iran or Lebanon for their military training. Three years before the Khobar Towers attack, al-Mughassil began coordinating the casing and surveillance of numerous locations where Americans could be found in eastern Saudi Arabia. Two years after starting the casing and surveillance- the target was set. 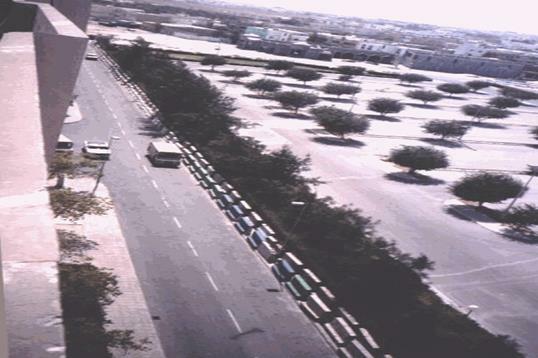 The cell began regular surveillance of Khobar Towers. For all practical purposes there was no difference between Hezbollah groups in Kuwait, Lebanon or the Hijaz. Iran helped all of them with funding, training, intelligence, logistics and the planning and execution of terrorist attacks. On the evening of June 25, 1996, the terrorists made their final preparations before leaving a farm in Qatif. The target-another American barracks was located about 45 minutes by car to the south. Hani al-Sayegh would drive the Datsun “scout car” accompanied by Abdallah al-Jarash. Ahmad al-Mughassil would drive the Mercedes Benz truck bomb accompanied by Ali Ali-Houri. The get-away car, a white four-door Chevrolet Caprice, favored for its big engine and steel bumpers would be driven by Hussein al-Mughis. The convoy of death soon turned onto Uhud Road before heading south on the Dhahran Jubail Expressway before exiting on Route 95. Now there was no turning back. Soon the three vehicles turned onto Old Abqaiq Road. The scout vehicle went ahead pulling into the public parking lot and signaled the coast was clear by flashing its high beams. Next the get-away car turned into the parking lot and Mughis positioned the Caprice to pick up its two passengers. With other terrorist groups the leader would never be anywhere near target. But Mughassil is not your ordinary leader. He slowly turned the Mercedes truck bomb into the parking lot and backed up as close to Building 131 as he could. These terrorists were not suicide bombers like the ones Hezbollah sent to attack the Marine Barracks and the French Paratroopers in Beirut. These Saudi Hezbollah terrorists wanted to escape to attack again. Staff Sergeant Alfredo Guerrero, an Air Force Security Police Supervisor made his way to the rooftop of Building 131. Guerrero was there to check on the two Security Police officers manning their posts. While Guerrero spoke with Airman First Class Chris Wagar, Mughassil backed the truck bomb into place. The two terrorists jumped into the white Caprice and made their escaped to Bahrain, where they discarded their vehicles. Soon these terrorists would make their way to Iran. The Security Police officers thought the truck and the actions of the terrorists looked suspicious and began evacuating the building. Within minutes the truck bomb detonated killing 19 Air Force members and injuring 372 Americans. The Iranians through their proxy-Saudi Hezbollah had struck America again. For the last nineteen years, Ahmad Ibrahim Al-Mughassil, Ali Saed Bin El-Hoorie, Ibrahim Salih Mohammed Al-Yacoub, and Abdelkarim Hussein Mohammed Al-Nasser have been able to avoid justice. Today, three Saudi Hezbollah terrorists remain outside the grasps of justice for the bombing of Khobar Towers. But we can’t forget that Saudi Hezbollah undertook this attack at the behest of Iran. Whatever the reason for the capture of Ahmad Ibrahim Al-Mughassil is, it is always a good thing to remove one of the world’s most wanted terrorists. After all, we owe it to the families of those who lost their lives 19 years ago.